• Emotional Intelligence — For the first time ever, FIFA 15 models the emotions of all 22 players on the pitch, giving fans a chance to experience first-hand the attitudes and personalities of the world’s best football players during a match. Players now recognize situations that trigger an emotional response and react naturally based on the game context. For example, a player that is being repeatedly fouled by an opponent could confront that opponent depending on the severity of the challenge and context of the competition. Players will respond authentically with new reactions to decisions, bad tackles, missed chances, goals, and other pivotal moments throughout the game. There are over 600 potential emotional reactions that could play out over the course of a game. • Dynamic Match Presentation — Match Day will feel more dynamic and alive than ever before – immersing you in the match action and never taking you out of the moment. With region specific behaviors, crowds will now be distinguished by cheers and chants designated to their club, league, country, or continent. Fans at Anfield in Liverpool feel and act differently than the fans at La Bombonera in Buenos Aires. Commentators will mention specific fan behavior triggered by unique fan moments like the Poznan or club songs. New Bench Reactions, 10 Player Goal Celebrations, ball boy animations, and contextual commentary will keep FIFA 15 fans engaged in the story of the match. • Team Tactics — Teams will now have contextual awareness of the game and will dynamically adjust their tactics according to the situation. For example, your opponent could be leading by a goal in the 88th minute and decide to hold the ball in the corner in an attempt to run down the clock. The end result is a more humanlike opponent that takes more risks when trailing, and potentially a more conservative approach when leading. Park the Bus, In the Mixer, and Time Wasting are just some of the Team Tactics fans will recognize in FIFA 15. • Authentic Player Visuals — The FIFA 15 development team created the Next Generation football player – ensuring players appear true to their physical form. An all-new physically-based rendering lighting system changes the way players look, ensuring users are able to see a level of detail in players’ faces which hasn’t been possible before. New body rigging and character models make players feel powerful and athletic, while kits move realistically and react with the environment becoming dirty with mud and grass as the match unfolds. • Living Pitch — Pitches will never be the same. Slide tackles and boot marks are now visible on the pitch, and as the match progresses, the playing surface becomes increasingly weathered just as it would in a real football match. Fans playing in rain or wet weather will notice mud and debris on the pitch. Corner flag physics, goal frames that shake, and animated LED ad boards are just some of the new details that bring FIFA 15 to life. • Agility & Control — FIFA 15 adds an all new level of responsiveness and control. Run Touch Dribbling allows players to better keep the ball under control in a sprint and in close-touch situations, giving personality to the most recognized players in the world. Leo Messi will dribble and move like he does in real life. Updated player biomechanics means that players will now react and move with balance and closer control when in possession of the ball. More precise steps and turns at low speed, and closer control at high speeds give fans more control and increased mobility when commanding players on the pitch. 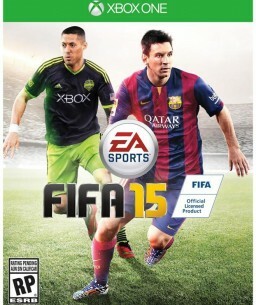 • Man-to-Man Battles — Dispossessing your opponent in FIFA 15 is more rewarding and physical than ever before. Players use Full-Body Defending to win possession and keep it. Possession Tackles will reward great defending, helping players keep the ball close to their feet when a challenge is won. New shoulder barges, push/pull mechanics, and big fall physics allow fans to feel the battle; shirt pulling is also visible thanks to new character visuals and improved cloth technology. • Correct Contacts — Physically Correct Contacts revolutionizes the way the football interacts with the players and their environment. Every dribble, touch, pass, shot, and deflection moves corresponding to the spin of the ball in relation to the position of the body part or object that it connects with – this gives the football accurate spin, curl, and movement, as well as varied trajectories. The movement of the ball in FIFA 15 changes the game. • Set Piece Control – FIFA 15 fans now have more freedom in attack with the ability to take control of teammates during throw-ins, corners, and free kicks. Using the right stick, FIFA fans can now control teammates off the ball to put them in the optimal spot to receive a pass during dead ball situations.